Temjen Toy, center, addresses ADB officials and others during a meeting among the ADB delegation and officials of the Nagaland government, on April 15 in the chief secretary’s conference hall in Kohima. Dimapur, April 15 (EMN): A delegation of officials from the Asian Development Bank (ADB) is in Nagaland to assist the state’s government authorities in preparing project proposals for external assistance concerning infrastructure development programmes. 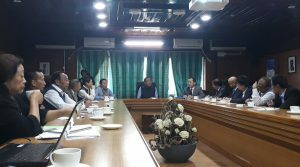 The officials from the ADB held a meeting with officials of the Nagaland government led by Chief Secretary Temjen Toy, on April 15 in the chief secretary’s conference hall in Kohima. The ADB delegation was led by its country director Kenichi Yokoyama, updates from the government publicity agency, the department of Information and Public Relations (IPR), stated on Monday. 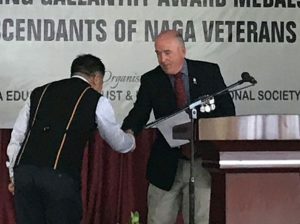 The purpose of their visit was to assist and guide preparation of project proposals for external assistance to the state of Nagaland. This visit was part of the ADB’s infrastructure development programme for India’s Northeast and implementation of the North Eastern Region Project Readiness Financing (PRF), the IPR explained. Senior Project Officer Ashok Srivastava said in his presentation that infrastructure development in the Northeast region was critical to the promotion of rapid, inclusive and sustainable growth. ‘Regional integration as a gateway to connect Asean and South Asian countries as per India’s Act East policy,’ the IPR stated. He was stated to have opined that poor infrastructure and limited connectivity have acted as roadblocks hindering the socio-economic development of Northeast region. The bank will assist the states in preparing ‘quality’ detailed project reports and ‘build readiness’ of the infrastructure projects mainly on infrastructure sectors such as roads, urban facilities and power. A PRF may support multiple sectors within one state or multiple states covering single/multiple sectors, it was informed. All the north-eastern states can have access to it except for Arunachal Pradesh, Srivastava stated. The key activities under PRF are preparation of DPR; conducting feasibility studies for prioritized projects; undertaking detailed economic and financial analysis including financial and operational sustainability preparation of social and environmental safeguard plans. Further, it will offer advisory support for advancing land acquisition and resettlement; and environment-related clearance and shifting of utilities. Likewise, it includes incorporation of innovate mechanisms and elements in the projects; advance procurement action, including preparation of bid documents; and tendering and bid evaluations. The key activities under PRF-II are to assist project authorities to set up institutional processes, guidelines and decision-making systems for project management and implementation of pilot testing of projects designed to test its validity; and to make necessary design adjustments ahead of implementation under any ensuing project; development of specific PPP project under transaction advisory services; and offering support to project start-up activities. After PRF-I and II, there will be a selection criteria, discussion of issues pertaining to the PRF followed by TA grants, he said. Also, they suggested plans and ideas of their respective department for consideration of the ADB for favour of assistance, the IPR stated. The principal secretary for Urban Development Abhishek Singh also gave a presentation. Officials from other “line departments” such as Urban, Medical, IT & C, PWD (NH), Power, Planning, and Transport, among others, attended the meeting, the IPR added.